Back and tail reddish. Feet, legs, and underside dark. Striped, bushy tail. White on cheeks and around nose. 10,000 individuals estimated, although some estimates suggest as few as 2,500. Gait is bear-like. Agile; special adaptations for climbing trees. Diurnal, crepuscular, and/or nocturnal. Daily activity includes periods of resting interspersed with feeding. Seasonally most active during summer. Leopards, dholes, Asian golden cats, Golden Eagles. Yellow-throated marten known to kill newborns. Eat leaves one at a time. Unusual digestive system. Single stomach, short gut length; lack digestion-aiding microbes. Resting to conserve energy is a strategy to compensate for low-calorie/qualtiy diet. 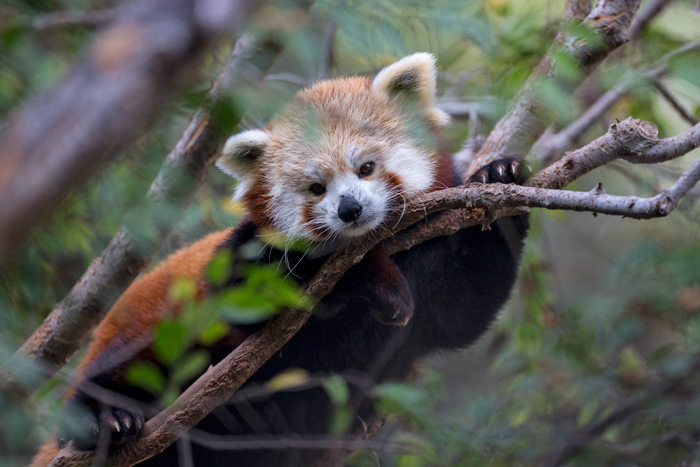 Must consume up to 30% of its body weight in bamboo each day. © 2011-2017 San Diego Zoo Global. Minor update to Conservation in 2017. 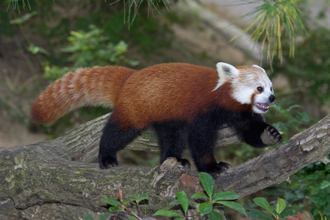 Some aspects of a red panda's lifestyle, such as eating bamboo, are similar to a giant panda's—but they are not related. 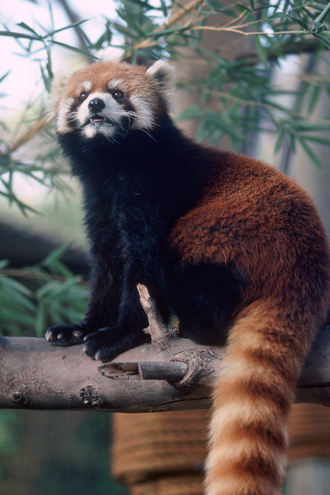 Subspecies, A. fulgens styani, found in China.